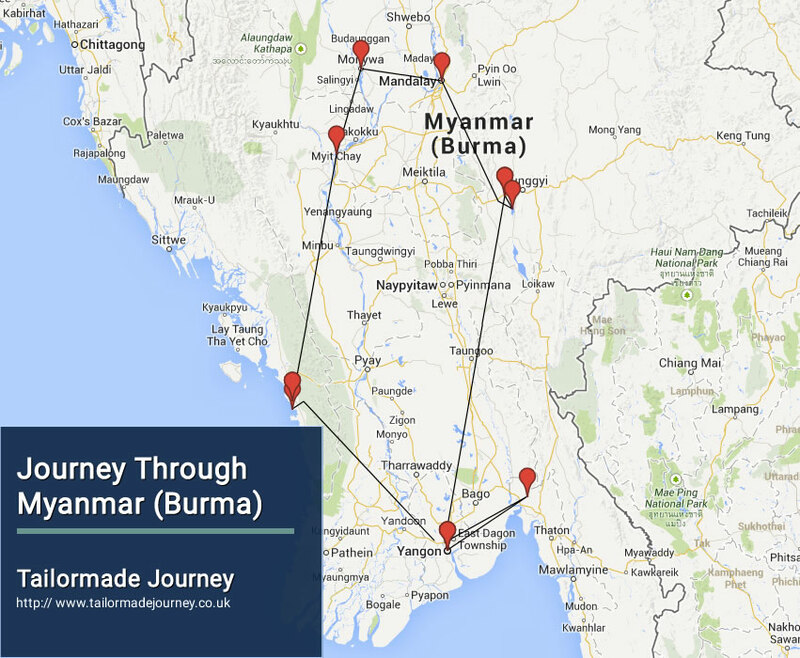 Travel through Myanmar and Explore the journey by visiting Yangon the Former Capital of Myanmar, Golden Rock & Bago, Lake of Inle , Mandalay, Temples of Bagan, Mt. Popa and in the end Beach to Relax. Arrive Yangon 2 Nights > Drive Kyaikhtiyo 1 Night > Drive Yangon 1 Night ) Flight Heho > Drive/ Boat Inle Lake 2 Nights > Drive/Boat Heho > Drive Mandalay 2 Nights > Drive Monywa 1 Night > Drive Bagan 3 Nights > Flight Thandwe > Drive Ngapali Beach 3 Nights > Drive Thandwe > Flight Yangon 1 Night & Leave. For The PRICE OF THE TOUR FILL the REQUEST FORM BELOW the TOUR ITINERARY & SUBMIT. Sightseeing Yangon, journey begins with walking downtown to explore the city centre and its fabulous mix of architecture and sites. The streets are filled with historical buildings many of which have a faded colonial charm not seen elsewhere in Asia. The journey being form Sule Pagoda with its golden chedi, which makes a useful landmark in downtown Yangon and impressive colonial style government buildings such as the City Hall, General Telegraph Office, the Supreme Court, High Court and many pastel- painted shops and apartments. Later visit to Bogyoke Market, , formerly known as Scott Market, a sprawling 75 year old shopping complex noted for its variety of handicrafts and other items which provide an excellent opportunity for a shopping spree. Afterwards, visit Chaukhtatgyi Reclining Image, Then, visit Kandawagyi Park, one of central Yangon’s greenest spots. Here you will see the glittering Karaweik barge, a replica of the royal barge, overlooking this scenic lake. Breakfast at hotel and proceed to Kyaikhtiyo, (190 km, approx 4 hour). Upon arrival at Kim pun base camp board on an open truck for (15 km, approx 1 hours) steep but well-paved road leads to the upper staging point to the renowned Kyaikhtiyo Pagoda site 1180 meters above sea level. (Optional : can alight from the truck at middle camp called Rathae Taung and walk up (approx 4 km : 45 mins) or as an easier alternative to walking, four porters at an extra cost can carry you in a sedan chair.) The Kyaikhtiyo Pagoda, 7.3 meters high, built on a gold-gilded boulder, 25 meters in circumference, and balanced in what appears to be a very precarious position on a tabular rock jutting out from a ridge in the Eastern Yoma Mountains. Kyaikhtiyo is likely to be one of Myanmar’s most spiritual experiences. Overnight Stay at the Hotel in Kyaikhtiyo. (Note: Our given tour cost, is based on truck fare (from Kinpun camp near to the pagoda platform) sit together with locals, should you wish to have a seat at the front (or) wish to hire the whole truck for yourself, please check prices and pay extra directly at the truck station.). After Breakfast, return to Kin-pun camp, lunch at local restaurant in Bago (on own expense) and then visit Shwe-Thar-Lyaung Pagoda, the colossal reclining Buddha Image lost to the Public for many years. Walk to Mon village to see weaving and cheroot factory, Maha Zedi Pagoda, Shwemawdaw Pagoda and Kambawzathadi Palace of the great king Bayinnaung and four Buddha images each 98 feet high at Kyaikpun with an interesting story in Bago and return Yangon. If time permits visit fruit and pottery market on the way back to Yangon. Upon arrival in Yangon check in at your pre booked Hotel. After breakfast you are transferred to Yangon Airport to board flight for Heho. Upon arrival in Heho Airport a scenic one-hour drive leads to Nyaung Shwe, the gateway village to Inle Lake. Along the way, stop at the wooden Shwe Yan Pyay Monastery which features beautiful carvings and a collection of Buddha images. Upon reaching the edges of Inle Lake, board a private motorboat to head out to Inle Lake, one of Myanmar’s most spectacular sights. Pass villages built on stilts over the lake, inhabited by the local Intha people. Observe the leg-rowing fishermen and see their floating gardens built up from strips of water hyacinth and mud and anchored to the bottom with bamboo poles. Visit Nga Hpe Chaung Monastery, which houses dozens of Shan Buddha Images, but is more famous for its unique ‘jumping cats’ who jump through hoops in the air! Continue to Phaung Daw Oo Pagoda, the lake’s main sanctuary, which contains five sacred Buddha images covered in gold leaf. From the middle of the lake, continue down a small canal leading to the Pa-oh village of In Dein. Explore the area on foot, strolling around the village, visiting a local school, and wander through the beautiful Alaung Sitthou area. Climb the covered stair way to the top which is filled with picturesque ancient stupas and has magnificent views of the lake below. After enjoying your visit to In Dein, return to your boat. Continue along the lake for additional sightseeing before returning to your hotel this afternoon the weaving village of Inpawkhon, famous for traditional silk-weaving, Se Gaung Village, famous for the blacksmith work and Nan Pan Village with cheroot making and boat-building dockyards etc. Later transfer to Nyaung Shwe by boat and drive straight to Heho Airport to board flight for Mandalay. Upon arrival in Mandalay airport you are met and transferred to your pre booked Hotel. Mandalay is the last kingdom as well as center of the Myanmar cultural, tradition, arts and crafts. Mandalay has long been known as a centre of skilled craftsmanship and in former times supplied the royal courts. Mandalay is well known for its skilled craftsmen and as you tour traditional workshops, you will learn more about the city’s cottage industries. Observe the production of wood carvings, kalaga tapestries, and gold-leaf where the techniques remained unchanged from those used centuries ago to craft items for the Royal Court. This afternoon, continue your tour of Mandalay with a visit to Kuthodaw Pagoda, whose 729 marble stone slabs of Buddhist scriptures have earned it the title ‘World’s Biggest Book’. Continue to Shwenandaw Monastery, the only remaining building from the 19th century Royal Palace. This grand teak building is known for its exquisite woodcarving. Head to the top of Mandalay Hill as the sun begins to set to enjoy magnificent views of the city and Irrawaddy River. Breakfast at hotel and visit Phayagyi to observe the most revered Mahamuni Image brought by King Bodawpaya in 1784 from Rakhine. The 4 meter seated Image was believed to have been casted in 1st century AD but over the year of offering gold leaf offering the figure is 15 cm thicket by gold. After a visit to stone carving, bronze casting and silk weaving process continue to ancient capital of Amapura “meaning city of immortality”. Visit Mahagandayon Monastery, home to several hundred of Buddhist novices and monks and observe the lunch process. Later, Excursion to the former Royal Capital of Inwa (AVA), reached by a short boat trip. Visit by horse-drawn carriage to Nanmyint Watch Tower (or) known as “the leaning tower of AVA”, Maha Aungmye Bonzan Monastery; the monastery built in brick & stucco by Queen Mai Nu, Bagayar Monastery; famous for its impressive ornate woodcarvings and teak posts. Later in the afternoon Enjoy fantastic sunset view from the 200 year old U Bein teak bridge span across Thaungthaman Lake (built in 1782) at the time when Amarapura was Royal capital. Return to Mandalay. Check-out from hotel and drive to Monywa via Sagaing. Sagaing is at the foot of Sagain Hills, covered with 600 white-painted pagodas and monasteries, Sagaing hill is widely regarded as the religious centre of Myanmar and is home of 6000 monks and nun, 100 meditation centers. On your way visit traditional bronze casting, silver smith works which Sagaing is famous for. Sagaing become the capital of independence of Shan around 1315 after fall of Bagan. Visit Tilawkaguru cave temple filled with impressive mural painting date back from 1672, Umin Thounzeh cave temple with multitude of seated Buddha statues and Kaungmudaw Paya, further west towards Monywar is enormous white dome rise 64 meter. Take a walk at interesting local evening market of Monywa. Overnight stay at the Hotel in Monywa . Monywa located on the eastern banks of Chindwin River is bustling up country town 84 miles (135 km) from Mandalay. Drive across the Chindwin Bridge for visiting Po Win Taung and Shwe Ba Taung Pagoda cave complex about 16 miles (26km) west of Monywa. This complex of 492 cave temples are packed with 2588 Buddha’s and there are beautiful 16th century wall paintings in some caves. After breakfast, begin your visit with a stop at the Colourful Nyaung Oo Market where every day the locals come to buy and sell fresh produce and other goods. Continue to the golden stupa of Shwezigon Pagoda for an introduction in to Bagan’s rich history. Then, visit to nearby Wetkyi-In Gubyaukgyi, a cave temple with exquisite jataka mural paintings and the elegant Htilominlo Temple noted for its fine plaster carvings and glazed sandstone decorations. This afternoon, your sightseeing starts with a visit to a workshop where you can observe the detailed production of lacquer ware, one of Myanmar’s best known and most traditional handicrafts. Continue to Myinkaba village and take a short walking tour to explore Wetkyi-In Gubyaukgyi, a cave temple with exquisite jataka murals and the temples of Manuha and Nan Paya. Climb to the top of one of the monuments to enjoy magnificent views over Bagan’s temples at sunset. Today, we will make sightseeing with a horse driven cart though the temples of Bagan: Morning visit to Southeast of Bagan: visit Minnanthu village, to see daily life style of Bagan people. The horse will take you along the path near Damayangyi, a massive-looking temple dating from 1170 that is famous for its interlocking mortarless brickwork. Next, visit Mingalazedi, the last of the large Pagodas built in the 13th Century, representing the pinnacle of Bamar pagoda architecture. After today’s tour, board a local boat for a slow cruise down the Irrawaddy River. As you cruise the waters, observe the lifestyle of the fishermen and riverside villagers as well as enjoying the unique perspective of Bagan’s temples. Today you are transferred Yangon Airport to board flight for Onward Journey. Win Unity Resort Hotel features a spa, fitness centre and outdoor pool. It offers comfortable rooms and bungalows with free WiFi. All units are equipped with air conditioning, flat-screen cable/satellite TV and refrigerator. Shower facilities are included in the bathroom. Hotel offers 125 Rooms. Staff at the 24-hour front desk can assist guests with laundry and luggage storage. The property also has a tour desk, business centre and meeting rooms. Offering an outdoor pool, private beach area in Ngapali beach and a spa and wellness centre, Amazing Ngapali Resort is located in Gyeiktaw. It features a garden, sun terrace and accommodation overlooking the sea. Free Wi-Fi access is available throughout. All air-conditioned room types include a seating area and TV with satellite channels. There is also a refrigerator. Featuring a shower, private bathrooms also come with a hairdryer and free toiletries. Some room types offer a kitchen with stove and electric kettle. Amazing Ngapali Resort is a 5-minute drive to Thandwe Airport.